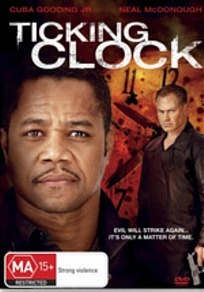 Reminiscent of Se7en, this thriller stars Cuba Gooding Jr. (Best Actor in a Supporting Role, Jerry Maguire) as Lewis Hicks, a crime writer who has definitely hit the bottom of the barrel after his separation with his wife. Without much going in his life, Hicks continues to investigate real-world crimes to continue writing when he's not drinking. Fortunately for Hicks, he is well connected with law enforcement who on occasion have given him some information to assist with his writing. Things soon turn even worse for Hicks when he crosses paths with Keech (Neal McDonough), a serial killer who brings our crime writer into his game. However when Hicks discovers the newly mutilated body of this new girlfriend, he uncovers the killers journals that lists a string of murders that have yet to have happened. As he uncovers more, his investigation soon leads him into a prime suspect of law officials as he must find the killer before the unsurmountable evidence buries him once and for all. The unfortunate aspect of Ticking Clock is that the movie puts all its cards on the table way too soon as all the characters have been established that forces the movie to become a game of cat and mouse as opposed to a real psychological thriller. Best described, Ticking Clock is filler move that never tries to break its clichéd premise and tries a little too hard for its own good, especially with its loose plot holes and even the actors who seem to be somewhere else. The video quality of Ticking Clock is quite a dark movie in terms of its settings but the images are sharp and clear. Colours when used are bright and we could only detect a few errors that did not deter from the film. Audio is good, although there are no real stand-out moments. Levels are quite perfect and work well with the dialogue, music and sound effects. There are no special features included in this release. All in all, Ticking Clock feels like a standard thriller telemovie that unfortunately let the cat out of the bag too early.